Jonjo O'Neill's gelding has won the last two renewals of the two-mile-five-furlong Grade One prize and could bid for a hat-trick in 2012. He has been taken out of the Gold Cup at the previous confirmation stage, leaving the Ryanair as his only option. Last season's Jewson Novices' Chase winner Noble Prince heads the ante-post lists for Paul Nolan, who is hoping for improvement in his charge, following his disappointing run at Fairyhouse on January 22. Davy Russell is set for the ride on Noble Prince, if, as expected, Tony McCoy is required to maintain his partnership with Albertas Run. "It's looking likely that AP will have to ride Albertas Run," said Nolan, yesterday. "I'd say Davy Russell will ride our lad, if that's the case. He's a man in form, he's ridden a lot of winners this season. Davy's ridden our lad plenty, he won on him earlier this year at Naas. I believe there's little rain forecast which is all in our favour and it looks like being better ground than last year." 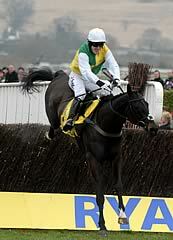 The eight-year-old remains a leading fancy despite the loss at the hands of Blazing Tempo in the Normans Grove Chase. Another major challenger from the Emerald Isle is the Robbie Hennessy-trained Rubi Light, a highly-creditable third in the race last season and arguably an improved horse now judged on his Grade One victory earlier in the campaign. Jockey Dominic Elsworth believes though that a step back up to the two-miles-five-furlongs of the Grade 1 Ryanair Chase will be ideal for Somersby, who he suggests is just inclined to make a mistake at two-miles and will find the longer trip at Cheltenham more in his comfort zone. 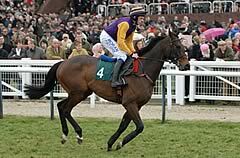 Elsworth clearly has a very soft spot for Henrietta Knight's talented chaser, the horse who gave him his first Grade 1 success when bravely landing the Victor Chandler Chase at Ascot on January 21. Forpadydeplasterer, who was taken out of the Queen Mother, adds to the strong Irish contingent. Captain Chris, Riverside Theatre and Great Endeavour are other notable contenders.